A day I had been looking forward to for some time arrived with the good news that we had arrived early and secured help from a local ship to disembark. So by 8:30 we were ashore. Today we were a group of 8 Josie,dan Michael,Valda, Barbara and Frank. We all hired a pickup with seating in the back and set off on an island tour. Josie sporting her best Amy Winehouse hair offering her protection for her head on the roof of the pick up. First impressions were that it is much the same as Cambodia but 10 years further along the development scale. Here the infrastructure is much better established good roads (they drive on the left as well) and English is spoken widely. Our first stop was an 80m waterfall and elephant rides. The waterfall was as you might imagine beautiful and the water warm enough to swim in comfortably - not that we did due to sightings of various wildlife that I didn't fancy invading my shorts! The elephant rides were more thought provoking. You all know I'm no tree hugger but seeing the elephants chained up and rocking back and forward put me off. They just looked sad (hey this holiday is turning me soft). Michael and Valda braved it and took a ride through the jungle down to the waterfall on the elephants and enjoyed the trip, it's not often you get to ride through the jungle on an elephant. 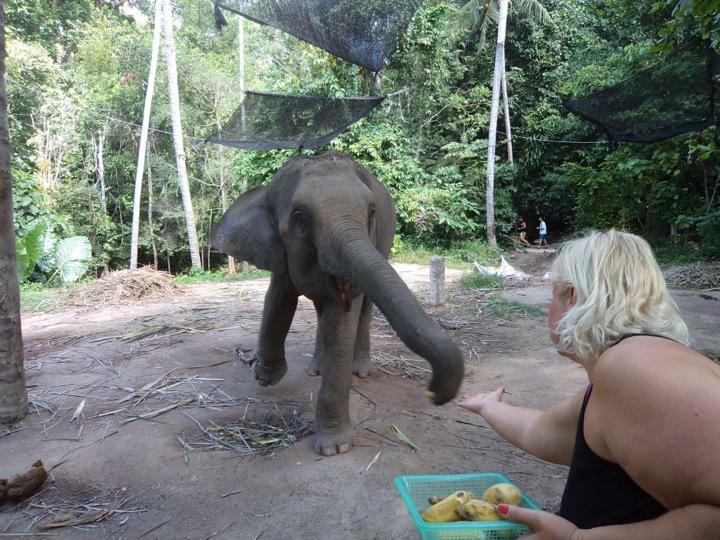 We settled for buying bananas and fed them. What's hard to convey in this blog is the feelings of roaming through tropical islands seeing the trees rivers and local people wandering around with washing balanced on their heads simple things that are so different for us Europeans that add up to a wonderful experience. We moved on from there to chaw bang (forgive spellings and treat them as phonetics - as usual really) beach. Laura told us about this beach and it is at the busier end of the island. Our driver dropped us off at the monkey bar beach end. Two minutes later the eight of us were lying under coconut palms in the shade on a beautiful stretch of white sandy beach. It was 35 degrees and cloudless. The sea must have been 28 degrees and clear blue water. To be fair the high tide mark was strewn with litter I guess this is from the late night revellers. This is an area where the youth party well into the night, but us eight looking ripped and tanned fitted in well! Barbra and Frank went for aThai massage on the beach with tropical oils. Josie and Dan took a stroll along the beach looking for acute sunburn - which Dan was to discover on his back later in the day. Wendy Valda Michael and myself took to the sea and following an exhausting hour in the turquoise water we settled down to a few local beers. In no time at all it was time to return to our taxi to get back the the ship. Of course we were two missing- the Aussies as usual, Dan and I set off to find them and guess what they were in the local Irish bar tucking into a pint of Guinness (good effort Valda) and lager. We hauled them out of there and set off back to the port. We arrived in good time for the last tender so decided to do a little browsing in the local shops. With time running out for the last tender we regrouped to leave, guess what , the Aussies were missing again. Where were they, we didn't find them this tine but later discovered they were in another bar. We have had a terrific day in Ko Suomi, my only regret is that we could not spend longer there. We will without double come back here again, it is not as unspoiled as Cambodia but it is similar and due to the commercialisation it would be easier to holiday there. That night back on board we mulled over our last three days in spectacular locations, we were exhausted and a few more pints of Stella and piña coladas later did not help out energy levels. What a struggle ........... But I'm up to it.